Our best selling elbow compression strap. Provides relief of Tennis Elbow and Golfers Elbow symptoms in over 80% of cases. As part of your treatment of Tennis Elbow or Golfers Elbow. 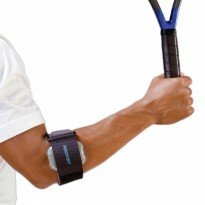 To relieve Tennis Elbow and Golfers Elbow symptoms during work and sports activities. One size fits most. 20-35.5cm (8-14''). Research shows that this product relieves Tennis Elbow and Golfers Elbow symptoms in 80% of patients. The patented Aircast AirCell is positioned at the elbow, against the tendons that produce bending and extending movements of the wrist joint. The AirCell is held in place with a comfortable foam strap. This is custom fitted by the user by tightening a Velcro strap.